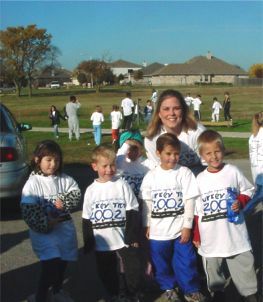 On Saturday, November 16, 2002, several of the kids and Miss Cooper braved the cold weather and attended Eagle-Mountain/Saginaw ISD's 4th Annual Turkey Trot. This is the one mile walk/run that the district has done for the last four years. There was a great turnout, and High Country captured the trophy again this year by having the most students and staff who participated. 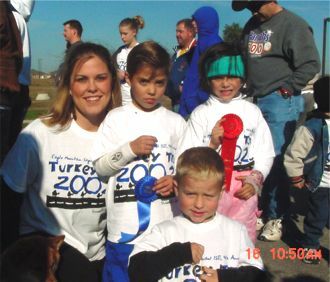 Miss Cooper & "Little Trotters"
Three of our kids took home ribbons this year ! Nate and J.T. 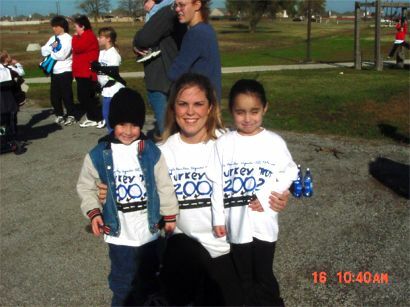 placed first and second, respectively, in the kindergarten boys division, and Amy ran with a broken arm and still managed to win second place overall in the kindergarten girls division. Congratulations to all of our participants and a special congratulations to our winners!! Thanks to everyone who participated! It was great to see so many of you out there on Saturday morning!